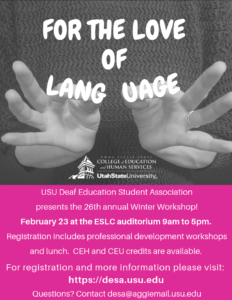 Now is the time to register for our Annual Winter Workshop! Click here for more information! Registration closes on Feb 21st, 2019. Hope to see you there! 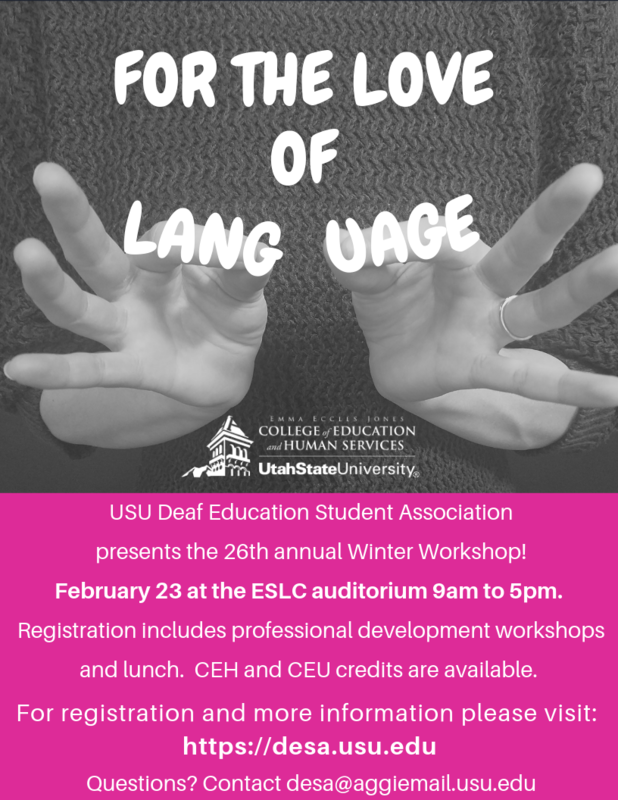 Pay Paypal by using email desa@aggiemail.usu.edu or use Eventbrite. See link below. *We will check for student ID at the workshop. 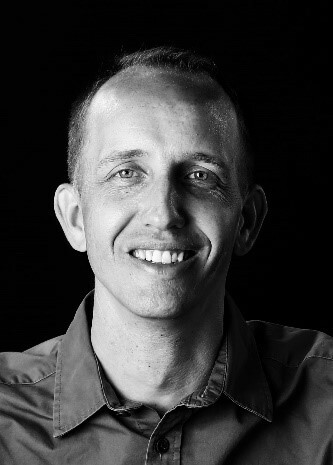 Keynote speaker: Martin Price- currently the Program Director of North Area of Utah Schools for the Deaf and the Blind, which includes the principalship at Kenneth Burdett School of the Deaf in Ogden, Utah. 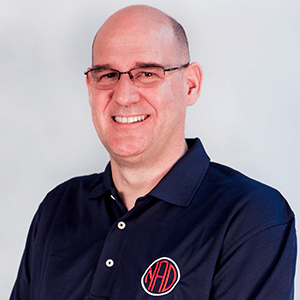 He hails from Washington DC Metro area where he grew up in different educational settings starting with the cued speech program at Gallaudet University. Martin obtained an Associate’s degree in computational mathematics from NTID/RIT in Rochester, NY. 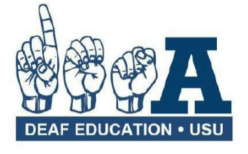 After a brief stint as an advocate of the Deaf, as well as an information specialist at Rochester Center for Independent Living, he graduated with a Bachelor’s degree from Gallaudet University with a double major in Government and Mathematics. After getting a master’s degree in Deaf Education from Western Maryland College, he taught mathematics at Florida School for the Deaf and the Blind. He later became the math curriculum specialist for both the Deaf and the Blind departments at FSDB. 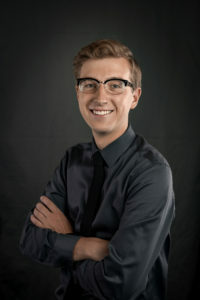 Prior to his current position, he worked as the Director of Community Relations with Sorenson Communications for three years. Topic: Where do the Questions Fit in? G. Dean Christensen- Certified Deaf Interpreter, has been in the interpreting field on many levels. For over 10 years, he has been involved in broadcast platform interpreting. He is one of the few court approved CDIs in the state of Utah. Dean is the owner of AfterImage, a business that delivers ASL translation and film production. With these experiences, he has the passion analyzing ASL delivery that challenges ASL interpreters to a new level. He has been employed by Sorenson Communications for 11 years serving the deaf community. 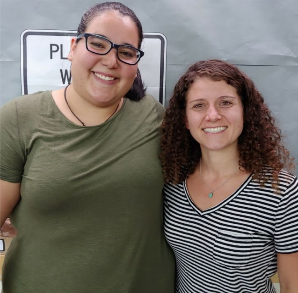 April Brunsvik and Courtney Hipskind- April and Courtney are passionate about their preschool class and even more passionate about dramatic play. Throughout their team teaching experience, they have seen children thrive in all areas by utilizing language rich dramatic play. They both reside in the East Bay and work at California School for the Deaf, Fremont. April graduated from Utah State University and Courtney graduated from University of California, San Diego. Together they have 10 years of experience in Deaf education and can’t wait to share with you! Topic: Supporting the Whole Child Through Dramatic Play- We all know that early childhood is an important time for learning and a critical period for language acquisition. Our hope is that when children arrive in the classroom at 3 years of age, they have age appropriate language. Unfortunately, in Deaf education, children arrive with varying degrees of access and language. Some children arrive with access to language from birth; however, many arrive with delays and even deprivation of language. So, how do we provide rich learning experiences that apply to all learners? Dramatic play is a platform in which ALL students can learn, thrive, and explore. Through hands-on, language-rich environments of intentional play, language development will flourish. Dramatic play not only provides a rich language environment for all Deaf children, it fosters all areas of development, supporting the whole child. Additionally, it allows for intentional exposure to the language tied to life experiences that are often missed due to lack of incidental learning. Come and learn how you can implement dramatic play in your classroom in cheap, easy, and intentional ways. Cody Simonsen- Cody Simonsen is a forward-thinking sign language interpreter and entrepreneur. He is Co-founder of 5 Star Interpreting, an on-site interpreter staffing agency, where he currently works as the Director of Operations. Pursuing a Masters degree in Interpreter Education at the University of North Florida, Cody actively seeks opportunities to learn, grow, and exchange ideas. Additionally, he holds national certification and has experience interpreting in many settings, his favorite of which is business meetings. He enjoys listening to audiobooks and playing board games with his wife and family. Topic: Interpreter, client relations- Interpreters and their clients have a unique relationship, Cody will draw parallels between this relationship and the relationships among certain species of animals. Examples of mutualism, parasitism, and commensalism will be compared and contrasted with relationships in the Deaf and interpreter spaces. Using research from the field of interpreting, he will describe some of the current trends and views of the interpreter-consumer relationship. Additionally, Cody will pose questions to encourage self-reflection for consumers and interpreters alike. What is the role of an interpreter? Of Deaf consumers? Do interpreters not give enough? Too much? Participants will discuss strategies to create healthier, more sustainable relationships between interpreters and consumers. Jasmine Taylor- Jasmine Taylor is a fourth grade teacher at Jean Massieu School of the Deaf. She has a BSEd in Early Childhood Education and MEd in Deaf Education.